Not having enough school funds can create a sticky situation. So can raising too much. Just ask Maureen Fyan, principal at St. Theresa, 5001 E. Thomas Road. 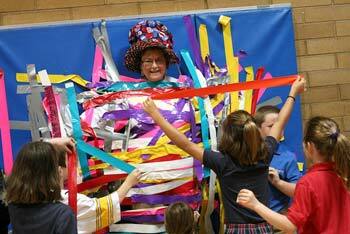 She let the class who raised the most money during a fall fundraiser duct tape herself to the wall Oct. 5. Overall, the school sold more than $18,100 worth of gourmet food through Krista’s Gourmet Favorites. That’s double what St. Theresa students raised last year by selling wrapping paper. This entry was posted in Event and tagged school fundraiser by Cindy Basile. Bookmark the permalink.